Since @mgny441 asked, I've created a post here in case anyone wants to discuss films they've seen at TIFF this year. Feel free to add to the comments, but please try to keep it a discussion of the films themselves. By popular request, I've created a page for comments for ticket trades. Only post here if you are willing to trade tickets, or sell for the value you paid for the ticket. Do not post here if you are simply looking for tickets or are trying to sell above face value; I may delete such comments (note that the range of prices for premium tickets is $49 to $56, and regular tickets is $25 to $32). Note that with the move to Ticketmaster, I don't know how exactly how ticket transfers will work especially since people can have TIFF-printed tickets, print-at-home, as well as mobile tickets. It looks like the new Ticketmaster system does allow for ticket transfers, and once you receive and accept the e-mail with the transfer, the instructions seem to indicate the ticket is yours at that point and can't be revoked or cancelled by the other person (I mention this as Toronto has been hit recently with a spate of people selling and then cancelling Presto transit cards). 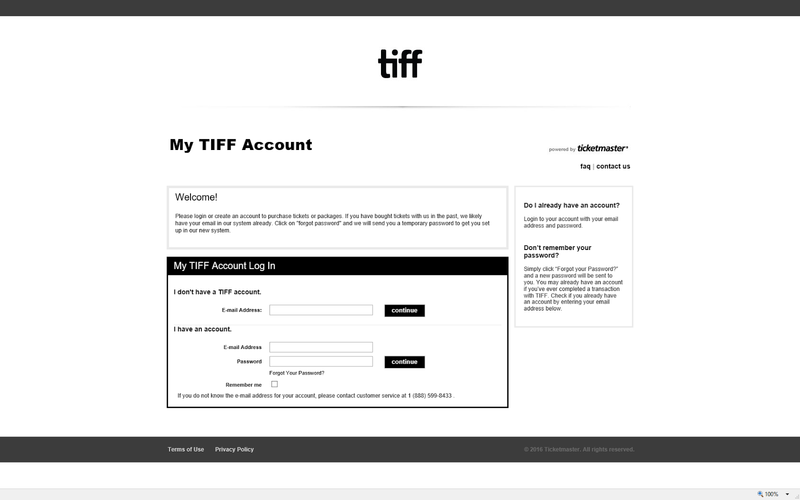 A transfer through Ticketmaster might be your safest bet, and then maybe TIFF-printed tickets; personally, I'd avoid accepting PDFs or print-at-home tickets. By popular request, here is a posting for current off-sale films for TIFF 2016 (as of Sep 2 10:58 PM). Note that films that appear off-sale here may come back on-sale as tickets are released or if the festival releases additional inventory. Please post additional off-sale (or films that come back on-sale) in the comments, but restrict any questions around the ticketing systems or issues with it to the previous post on this blog. Thanks! The official schedule is out today for the festival. Programme books will be available for pickup at the Festival Box Office starting at 9:00 AM. New this year, you can print out your pickup voucher at home from the ticketing website, just bring it with you when you go to pick up your books. If you bought a My Choice regular or premium ticket package, then yesterday you should have received an e-mail with instructions and your starting login time for selection. Starting at that time, and not before, you will be able to log into the ticketing site to select your films. I got an 11:00 AM start time next Monday as an example. Selections and inventory are updated in real-time. You have a limited time window once you log in to make your selections. You receive vouchers if you don't select all your available screenings in your package. Once you submit your selections you cannot log back into the website to make changes. One new change is that you no longer have to pick up your tickets in person; you can choose to use a mobile device or print your tickets at home. If you can't make it out in the image, the new site is powered by Ticketmaster. It will be interesting to see what the performance of the new system is under load when individual tickets go on sale. In past years, the old system was pretty much guaranteed to go down. In more recent years they introduced a waiting room to which you were shunted if the site was overloaded. The problem with the waiting room was that it wasn't very good at letting people back in following the order they first arrived at the site. assuming it let you back in at all, which generated a lot of frustration. I'm cautiously optimistic about the new system, so we'll see how it goes this year. The festival has released dates and information about ticketing for the 2016 Toronto International Film Festival. The festival has updated their website and ticketing experience. Existing members will have to setup a new Member account online; they will receive an e-mail on July 12 with instructions on how to setup their new online account. It will be interesting to see if they have made any performance improvements as well to handle to crush during individual ticket purchases. New this year, the festival says that you will be able to print your tickets at home, use mobile tickets, and transfer e-tickets to friends, although you still have the option to pick up tickets in person from a box office if you prefer. I wonder how much this may cut down on the box office lines before and during the festival. Dates for the festival can be found at the official TIFF site or at my page here: http://tifftalk.blogspot.ca/p/important-dates.html. Existing Members will be able to purchase ticket packages at 2015 prices between July 18 and July 22. After that, everyone will have to pay 2016 prices which are below. In general, each package increased in total price by about $10 over last year (except for the Closing Night Gala which is still $205).